Baroness Cox’s Contribution to the Global Forum in Yerevan on the Occasion of the Centenary of the Armenian Genocide. 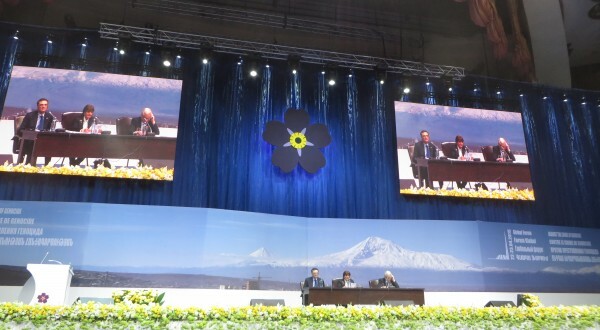 Many may have read HART’s report on the Global Forum Against the Crime of Genocide, which took place in Yerevan, two days before the official date for recognition of the centenary of the Armenian Genocide. Day two of this forum was chaired by Patrick Devedjian (France), Nikolay Ryzhkov (Russia) and Baroness Caroline Cox (UK). It gave the platform to 30 Parliamentarians from various countries including the 22 who had officially recognised the genocide at that time. The parliamentarian session was a valuable opportunity to advocate for recognition of the Armenian Genocide and for contemporary genocides to be highlighted as well. In her speech, Baroness Cox was able to draw attention to the Sudan regime’s genocidal attacks on the people of the Nuba Mountains and Blue Nile regions as well as the plight of Armenians in Nagorno-Karabakh. The full text of Baroness Cox’s address is available to read below. To read HART’s report detailing arguments from various planelists made up of scholars, lawyers and politicians, please follow this link or download the report directly at the bottom of this page. I wish to thank the organisers of this historic forum for the privilege of taking part and to congratulate Armenia on convening this Forum with significance not just for Armenia but for all humanity. This is the only place in the world where I would wish to be today. And I thank you also for the privilege of co-chairing this important meeting and for the opportunity to make a brief contribution at this historic, sombre time for the Armenian people – and for all people who care about truth, justice and freedom. I am deeply grateful to share these events which are so important in memorialising the horrendous suffering of the victims of the Armenian genocide and hearing the testimonies of many world class scholars highlighting the fundamental importance of recognition. But I am also personally deeply sad that I am a member of a Parliament, the Parliament of the United Kingdom, whose Government refuses to recognise the Armenian Genocide. I believe this is shameful. But may I mention that, within the UK, Wales and Scotland have done so – and I applaud them and all national Governments which have done so. In these days when we join with the Armenian people their memories of the horrors which befell them during the Genocide, I wish to add my voice to those of all who highlight the 3 essential priorities for the need for recognition of the Genocide. I appreciate your inclusion of other genocides in this Forum, including the Rwandan genocide. Esther’s personal testimony powerfully and eloquently brought to us the horrors perpetrated against her people and – the hope emerging even from those horrors. It is very important that, in this Forum, dedicated to Genocide recognition, that we put on the record other contemporary genocides which are so off the radar screen that they have not received a mention here. One example is the genocide currently being perpetrated by the Government of Sudan with its policy of attempting to eliminate Africans and Christians and Muslims who do not support their Islamist ideology. I visited the people of the Nuba Mountains and Blue Nile State earlier this year and witnessed the effects of constant aerial bombardment of civilians – markets, clinics, schools causing half-a-million to flee, many hiding in snake-infested caves or river banks. The bombers now come at night with searchlights so they can kill by night as well as by day. Another attempted genocide, still condoned, is Azerbaijan’s attempt to annihilate the Armenians in your historic land of Artsakh. I wish to say what a privilege it was to be with your people so many times when you were holding a frontline of faith and freedom for the rest of humanity. Now, whenever I visit Armenia and Artsakh, I am humbled and inspired by the spirit of the Armenian people: you not only survive but you create beauty from the ashes of destruction. But Azerbaijan continues to threaten to kill and it is essential to call Azerbaijan to account for past attempted ethnic cleansing and for threats for the future. Nagorno Karabakh has at least as valid a right to self-determination and Independence as the people of Kosovo and I believe we must strive to achieve this justice for the Armenians of Artsakh. In these days when we join the Armenian people in their memories of the horrors which befell them during the Genocide, I wish to highlight 3 essential priorities for the need for recognition of Genocide. First, recognition of truth – historical as well as contemporary, is essential for healing and reconciliation, as so eloquently and powerfully emphasised by His Holiness Pope Francis “concealing or denying evil is like allowing a wound to bleed without bandaging it”. Secondly, it is also in the interests of the Turkish people themselves to acknowledge the truth of this part of their history. I also greatly appreciate the contributions of speakers from Turkey at this Forum. I believe many Turkish people wish to recognise the Genocide. Some years ago, when I visited Turkey on a lecture tour to my professional nursing colleagues in Istanbul and Ankara, I met many who fully understood the nature of the Genocide and stated their wish that their Government would do so. They claimed that they hated the refusal to accept the truth and they felt that no nation could provide a healthy environment, especially for younger generations when it continues ‘to live a lie’. Also, it is important to remember and to honour those Turkish people who helped the suffering Armenians – saving lives or alleviating suffering, often at great personal risk during the horrors of the perpetration of the genocide. And it is also important to honour those Turkish people who have had the courage to acknowledge the genocide – sometimes paying the ultimate price for the truth. Unless Turkey itself recognises all that happened, tributes cannot be paid to brave Turkish citizens who deserve to have their goodness recorded as rays of light in those dark days. All of us here today are proof that Hitler’s hope of the obliteration of memory of the truth of the Armenian Genocide has failed. 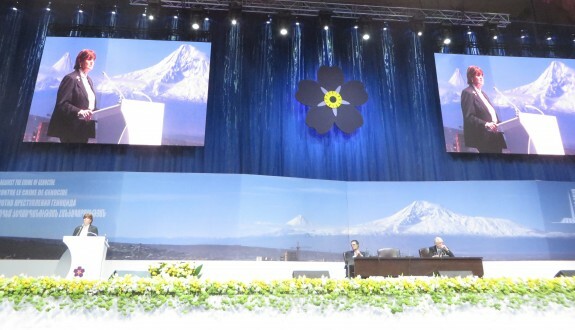 Today, in this Forum, we call all people who care for truth, freedom and justice to persist in memorialising the Armenians and others, including the Assyrians and Greeks, who perished in the Genocide. May we never forget. And may we never be silent while the evil of any Genocide remains unrecognised or continues to be perpetrated with impunity. We who have freedom have an obligation to use our freedom on behalf of all who are denied their freedoms.